Not only does Marty get attacked by a holographic shark, but he turns around to see a holographic billboard blasting sound throughout the town square. It’s Goldie Wilson III selling hover conversions. Many states still have billboards on the highways and in downtown areas. Some of these have even become electronic billboards that are animated or change between multiple ads every few seconds. 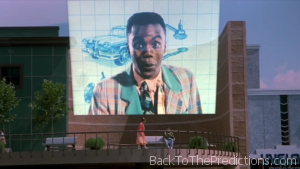 However, we don’t have large holographic screens like this at all. Not yet. Even if we did have these billboards, it’s doubtful that people would tolerate the volume being loud enough that you could hear it as loud as Marty could all the way across Courthouse Square.